Between this blog and Cokemachineglow, I’ve probably written more nice things about Rose Melberg than anyone on the Internet. I sure hope so. The Softies/Go Sailor/Tiger Trap singer’s latest project, it’s no surprise, deserves more kudos. Brave Irene is a five-piece band that finds her returning to the beloved jangle-pop sounds of yore, though the group’s tightly knotted harmonies and underlying vintage keyboards gives it a psychedelic feel absent from her previous work. 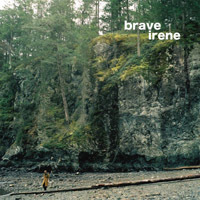 Brave Irene is fuzzy but not Alf-esque, with an engineering job that squeezes its pleasures into a trim, compressed package, like a Snickers bar. With its eight songs lasting a mere 17 minutes and the high-energy band going full-tilt throughout, it’s certainly a sugar rush. It’s a long-awaited shift for Melberg devotees — her previous discography includes two low-key singer-songwriter albums (“Mom records,” she’d call them) and three equally quiet full-lengths with the Softies (full disclosure: my favorite band). But a brief reunion tour with jangle heroes Go Sailor seems to have sparked her electric side once more. Fresh influences, too: Caitlin Gilroy and Jessica Wilkin’s keyboards hat-tip toward Felt at times, while at others the boisterous treble is more in line with Quasi. Brave Irene is pointedly a group project, not another solo set, but even amid the blur of a band, Melberg’s voice — a once-in-a-generation blend of elegance and affability, endless sorrow and revenge served cold — can’t help but shine like a beacon. I promised myself I’d make it through this review without making fun of Best Coast, so if you’ll excuse me, I will now listen to this for the third time in a row.